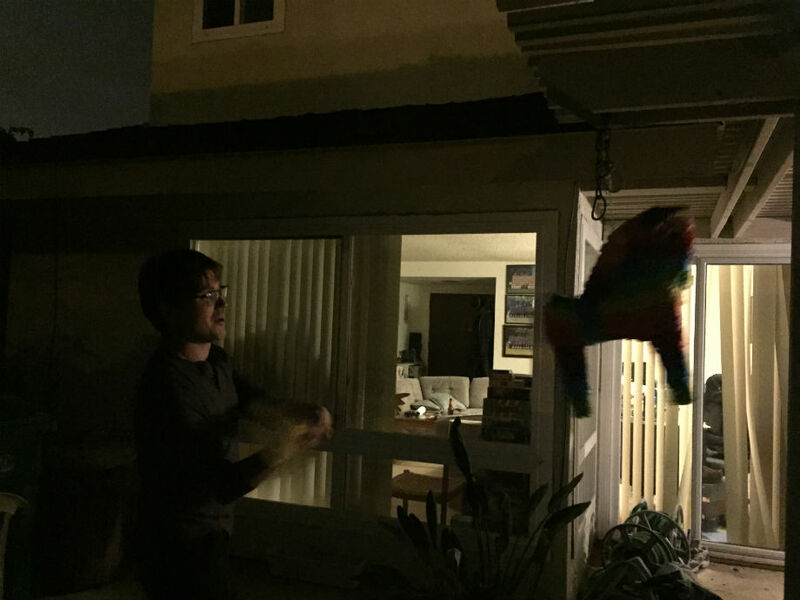 This entry was posted in Anime and Manga, Events, Photos and Screenshots and tagged Anime Expo, Anime Expo 2011 on July 7, 2011 by TheUser. Shaman, originally uploaded by theuser. I also met a Tauren shaman. Check out his awesome totems! This entry was posted in Anime and Manga, Events, Photos and Screenshots and tagged Anime Expo, Anime Expo 2011, Moblog on July 2, 2011 by TheUser. Dr. Robotnik!, originally uploaded by theuser. 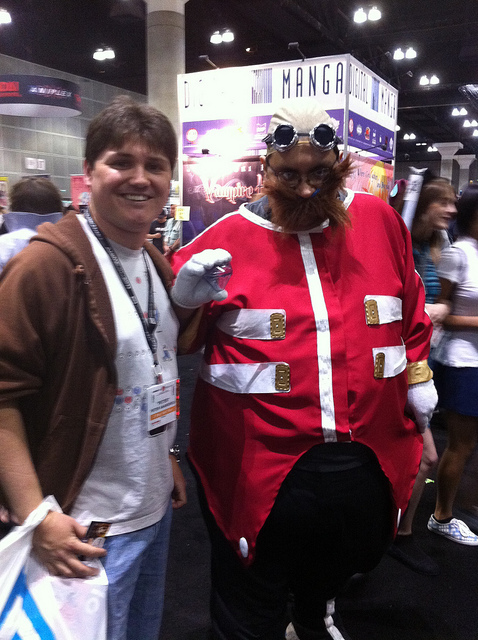 I met the evil Dr. Robotnik at Anime Expo! He seemed like a cool guy! The second day of Anime Expo was relatively uneventful. The first thing we actually did was go to M Grill, a Brazilian steakhouse in Koreatown in LA. Edward wanted to join us and use our hotel room, so taking us out to eat was his payment. It was a fantastic restaurant. Like the other Brazilian steakhouse at which I’ve eaten, various meats are brought around the room and offered to you. It’s all you can eat, and you pick on a per-meat-basis if you’d like a piece. As for the actual Expo itself, we didn’t have a lot plan. We walked around a bit looking at cosplay, spent some time in the Exhibit Hall, and read in the Manga Lounge. We went to the laser show, but it was kind of boring. AX staff were also passing out tickets to the MELL concert. It seems they were having trouble filling the audience (as usual). We said we weren’t interested because of the laser show, but they gave us tickets anyways. It’s lucky they gave them to us even though we didn’t want them; we went to the concert after getting bored of the laser show. MELL is a techno/trace inspired rock singer, and the concert was a lot of fun. Juan, a friend who was with us, got removed for taking photographs, but they allowed him to come back after confirming that he deleted the photos. The third day was packed full of events! In the morning, gem and I went to a panel on creating steampunk characters. The emphasis was on creating characters to cosplay so it talked about making the props. It was a lot of fun! The panel was hosted by the League of S.T.E.A.M., which is a group that does live performances and webcasts of a steampunk verson of Ghostbusters. They had a lot of cool props, including a plunger gun that actually worked (after building up pressure for what seemed like forever – something that’s actually cool since it’s steampunk) and a gun that launches a net. I guess I forgot to mention what happened on the way to the panel. I was eating a banana nut muffin that tasted a little strange. It had the taste of bread, bananas, nuts, and… dental adhesive. How strange. Then I noticed that my crown fell off. After the panel I cleaned everything as best I could and popped the crown back on my tooth. It seems to be staying pretty well, so I’m going to wait until Wednesday when I’m more free to go see the dentist. It should be relatively easy to adhere again. After that was all taken of I ran into Jennifer Damm cosplaying Princess Peach! That was pretty fun! Next we went to Chibi Masquerade. It seems that Masquerade is an event for cosplay skits and is a competition. Chibi Masquerade isn’t a competition and accepts anyone in costume. It’s like a training ground for Masquerade. It was really fun! Some people had lines and dialog, other groups danced, and some just came on stage quickly to show off their costumes. Two cute little boys dressed as characters from Naruto fought on stage for example. Tuxedo Mask gave a monologue about being divorced from Sailor Moon and living with his brother. He was hoping to meet someone new and gave out what I assume is his actual phone number. Also, War Machine got on stage! His costume was amazing! It had a shoulder-mounted gun that really moved and the glowing core. Next we went to AX Idol. We got there an hour or hour and a half early, which kind of sucked because the show started late. Idol was as the Nokia Plaza in LA Live so we wanted to get there early due to limited seating. Jennifer and her friend ended up running into us there and sat with us. gem noticed someone sitting near us in a fleece panda sweater. She wondered who would buy such a thing, then realized that Linh-Nam did, and then realized that it was Linh-Nam! We talked a little, and I met his girlfriend, but then the show started. AX Idol opened with a song by the host’s band, and then Idol itself started. It was a great show! I really, really enjoyed it. Then we went down to see Last Comic Standing. As usual, Last Comic Standing was very funny. I saw a lot of returning comics, including Soap, who made it into the finals. Unfortunately he lost to other person in the finals. Luckily though most of comedians were great. We woke up on the fourth day to find that the power was out in our bathroom. This made taking showers and going to the bathroom more difficult. We took turns going to the bathroom with the door wide open and the rest of us waiting outside the hotel room. Edward the only person who didn’t shower the previous night, so he was the only person who needed to shower. He just left the door open a bit and took off his clothes after closing the shower curtain. The last day was much less crowded. Edward and I went to an anime podcasting panel that gave tips on podcasting hosted by Anime-Genesis. It was short but fun, and we got free t-shirts! Although we went to get tips because we want to start a gaming podcast, I think I’ll also check out the Anime-Genesis podcast. Afterwards we spent a little time in the Manga Lounge and Exhibit Hall. I read the first volume of Cheeky Angel, a manga about a boy who wishes to be the manliest man but gets turned into the womanliest woman. It was pretty amusing. In the Exhibit Hall I got a sweet Sonic tshirt and a cool Shy Guy tshirt. Yay! We left as the Exhibit Hall closed and went to Orochon Ramen like we do every year! I had a tasty miso-based soup with egg and tofu! Yum yum! And then we went home! Yay! This entry was posted in Anime and Manga, Events, Journal and tagged Anime Expo, Anime Expo 2010 on July 5, 2010 by TheUser. I was pretty on Day Zero. I only slept for three and a half hours, and then we had to buy a bunch of snacks with Antonio. When we got down to LA, we parked in his staff parking and went in search of his badge. The people he expected to have his badge didn’t because Antonio told them he wasn’t going to come Day Zero. gem and I line up for our badges, and it took about three hours. They couldn’t find her information but then printed hers anyways after she showed her email confirmation. Later we came back at night so that Antonio could get his badge at the staff meeting. gem and I sat down in some chairs while Antonio was in his meeting. It ended around 11:30, and when we went to leave, the doors were all locked. LACC staff were confused and kept asking us how we got inside. They seem surprised to find out that we came in the main entrance two hours earlier. They just locked up without checking the upper levels or saying anything. Idiots. Our hotel room’s really small, but the hotel’s location is great. It’s a 10-15 minute walk from the LACC, is right next to an IHOP and Subway, and is one block from a Ralph’s. Plus we filled our room with snacks! Yesterday we started our day by getting AMV contest tickets. I expected it to be annoying, but we waited in line for less than a minute. After we got our tickets, I went to the Manag Cafe and read the first volume of the Sunwell Trilogy and a bit of FLCL. Then we checked out the Exhibition Hall and met Ann. We also checked out the arcade and the table-top gaming room. I doubt I’ll play, but it was pretty cool! The AMV Contest was longer than I would have liked as usual. However, I thought the AMVs were really good. I had a great time. The best part was Edward. He showed up late on Day One and got his ticket separately from us. Because he wanted to sit with us, he offered the guy sitting next to us $15 to switch tickets. Surprisingly the guy said okay, swapped and left. Then I noticed that the guy didn’t go to place that Edward’s seat was located. Edward checked the ticket and found out that the guy’s ticket was for a seat far from us. He was just sitting there. It was hilarious. He tried to pay off the girl that showed up for the seat. She seemed interested, but her friends wouldn’t let her. Edward sat alone. This entry was posted in Anime and Manga, Events, Journal and tagged Anime Expo, Anime Expo 2010 on July 2, 2010 by TheUser. Anime Expo is less than a week away! We check in next Wednesday and the expo is Thursday through Sunday! I’m sure we’re gonna have a great time. I’m not really sure how ticketing works for everything though. Things are kind of confusing on the site. I guess that’s usual for AX though. They’re always incredibly disorganized, and it gets worse every year. I really want to see Last Comic Standing and AX Idol. I’m not as interested in the AMV contest as everyone else, but it’s fun, and I know my friends want to see it too. I don’t know what exactly I’m most looking excited about. I think it’s just the atmosphere and seeing people in cosplay. At E3 there was lots of cool stuff to see, but I constantly had to rush around. It’ll be nice to have things to do without having to be in a hurry. And this year I think I’ll meet my goal of not spending any money! Sadly it’s because I don’t have any! This entry was posted in Anime and Manga, Events and tagged Anime Expo, Anime Expo 2010 on June 24, 2010 by TheUser.